The backstory for the subject of today’s review is quite fascinating. In 1956, Michael Avallone created a magazine called Tales of the Frightened. The plan was that it would act as a promotional tie-in to a radio series starring Boris Karloff. Sadly, the magazine was short-lived and the radio series fell through. Thankfully, Mr. Avallone was able to reissue the stories as a book and the Karloff recordings became two classic LPs in 1961. In 2010, his son decided to do a modern take on the matter. As the original albums used electronic music, Avallone tapped Eban Schletter to compose while obtaining the services of Vernon Wells to narrate. Yes, that Vernon Wells. 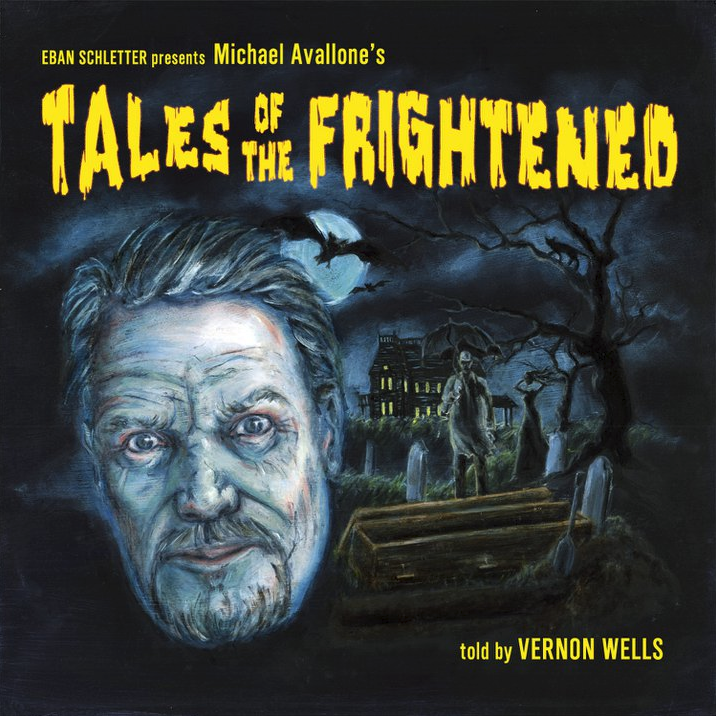 The album’s 16 tracks are evenly split between instrumental numbers by Eban Schletter and the readings (with musical backing) by Vernon Wells. The aptly-titled “Prelude” is both creepy and effective, in addition the setting the tone for many of the music tracks. Of particular note are the theremin-style “Grave Robber” and the energetic and foreboding “Samba Of The Frightened.” In the tracks featuring the actual stories, its planned radio origins are apparent in how the narrator greets the listener at the beginning of each story and closes out with a spooky offhand comment. It’s also worth noting that the selection of stories are taken from both volumes of the original LPs. “The Man in the Raincoat” tells the story of one Sylvester Dodge, who has a chance encounter with a strange man in a raincoat who follows him everywhere. Will he be able to evade him in order to leave for his dream vacation? In “Don’t Lose Your Head,” a traveling salesman visiting postwar Shanghai is woken up in his hotel room by a strange scratching sound. I won’t spoil it for you by telling you what he finds, but let’s just say that things only get stranger from there. The use of music in this story is great, as is the brief use of a sound effect to represent a character. That said, its similarity to a story from the comic book Hellboy implies this is based on an old Asian folk tale. “Never Kick A Black Cat” details what happens when a construction manager makes the mistake of kicking a back cat he encounters on his way to work. As was the case from the previous story, the use of music and a single sound effect work wonders when combined with Wells’ reading. In “Just Inside The Cemetery,” a lawyer in a small town sees two men digging a fresh grave at the town graveyard. Thing is, nobody has died recently (even though the gravediggers insist otherwise). Overcome by curiosity, he makes the fateful decision to investigate the grave after midnight. “The Hand Of Fate” is a very interesting tale, where a servant returns to his employer’s mansion scared witless. Why? Because he saw Death in the marketplace and demands a horse in order to flee from him. The employer obeys, but is so upset over the matter that he goes into town to confront Death himself! The last surviving member of the Alexis family encounters a mysterious beautiful woman while hunting in the marshes. Instantly smitten, he proposes and has her move into the ancestral castle. But was has the once-healthy Count Alexis suddenly become sick while his new bride is healthy and never comes out during the day? Considering that the name of story is “The Vampire Sleeps,” the answer should be obvious. The final two tales should be very familiar for those who’ve read countless scary stories. With a title like “The Deadly Dress” and a plot about a poor girl getting a beautiful dress for a big party cheaply, do I really have to say more? I will give it credit for offering multiple explanations for the finale, though. “Call At Midnight” deals with a lonely man whose true love had died during WWII. But if she’s dead, then why does she call him one day to request that he call a special number at midnight? Those going into this expecting an awesomely over-the-top, Bennett from Commando (aka the greatest movie ever made) performance from Vernon Wells will be disappointed. Instead, his deep voice is extremely effective and fits the stories perfectly (as is the occasional use of music). Although Wells occasionally adopts a different voice for a secondary character, the performance is more audio book than audio drama. While I personally felt that several of the stories are somewhat predictable, there are enough twists to make it interesting and they do admittedly have a simple, timeless feel to them. Speaking of time, the entire album clocks in at just under a hour. Although a stripped-down, limited edition preview version was released for Comic Con, the official full release came out in 2010 in the form of both burn on demand CD-Rs and .mp3 downloads. Here’s hoping that sales are good enough to warrant a sequel (along with reissues of the original Karloff versions), as listening to this was a blast. Those who feel the same way can also write in to request such releases here. In the meantime, Eban Schletter also has an album full of tracks similar to his work on Tales of the Frightened. Special thanks to Oglio Entertainment for the review copy!